Today I have another comparison post using Jesse's Girl Wild Thing and China Glaze Purple Panic, both purple neons. In the bottle, they sure look pretty close. 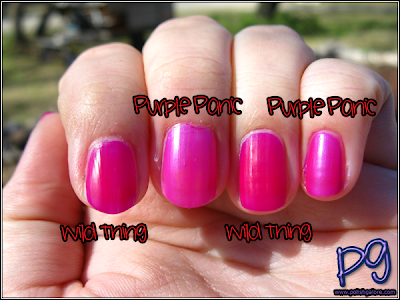 For both polishes I used a base coat of Seche Natural, and 2 coats of polish. No top coat was added to show the matte finish. 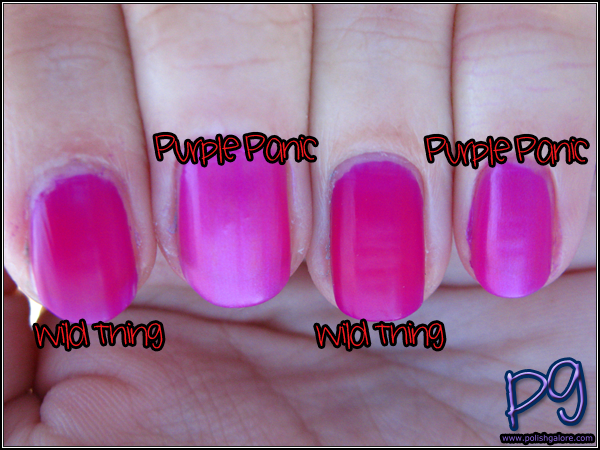 In the sun, you can see that Purple Panic is a bit lighter than Wild Thing. Sometimes, I like to use a base coat of white polish to make neons pop, but I've noticed that purples tend to pop regardless. In the shade, you can tell that these are cousins but not dupes of each other. Wild Thing has a darker purple base than Purple Panic. Tada!